Organizers strive to make the Bend Boulder Bash hard for competitors and entertaining for spectators. Joey Jannsen creates problems for other people. Specifically, the more than 100 sport climbers descending on the Bend Rock Gym this week to compete in the Bend Boulder Bash. Jannsen's job? Set vertical obstacle course "routes" for those making their way up the bouldering wall. He's the head "setter," which puts him in charge of designing the course's difficult twists and turns. "My job is to organize the routes for this event—making sure there's a diverse set for the qualifying rounds, as well as a good set of boulder 'problems' for the final round." Competitors who fail to navigate these routes and problems typically come tumbling off the wall. A setback, certainly, but it's a lot better (and safer) than falling off a mountain. 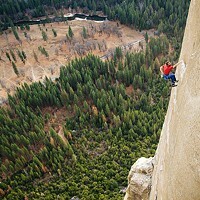 This sport, if you haven't already guessed, is a direct descendant of outdoor rock climbing. But before you dismiss gym climbing as just a creative way to get your heart pumping, remember, it'll be an official Olympic sport at the Games of the XXXII Olympiad—also known as Tokyo 2020. "It initially started as kind of a training tool to get climbers prepared for outdoor routes," says Jannsen. "But the general idea is still the same. You're still doing similar movement." 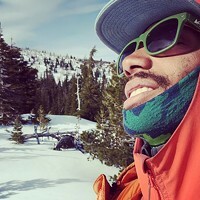 As for what you'll see at the Bash, he says, "If you're putting on a show and setting routes that people will find entertaining, it requires you to set moves that are drastically different than slow climbing outside—which is not that exciting to watch necessarily. We set moves in here that you'll rarely see outside, if ever." The Bend Boulder Bash brings together competitive climbers from around the area. Boulder Bash competitors, who vie for cash prizes, come from all over the Pacific Northwest. "We get a strong contingent of local and regional athletes, from as far east as Boise, and as far north as Seattle," says the gym's Director of Operations Rich Breuner. There's a qualifying round during the day, but it's the nighttime finale where things really get heated. "We turn off all the lights. It kind of creates this really cool stadium-like experience," he says. "The audience wants to see everybody do well. Every single climber gets an equal amount of audience participation. They're all super psyched to see whoever it is do well. They're not necessarily rooting for one individual, and that's another cool aspect of the overall vibe and atmosphere of the finals." 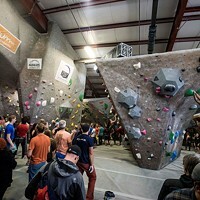 Related Boulder Bash Blows Up: Bend Rock Gym climbing competition goes big, and goes home! 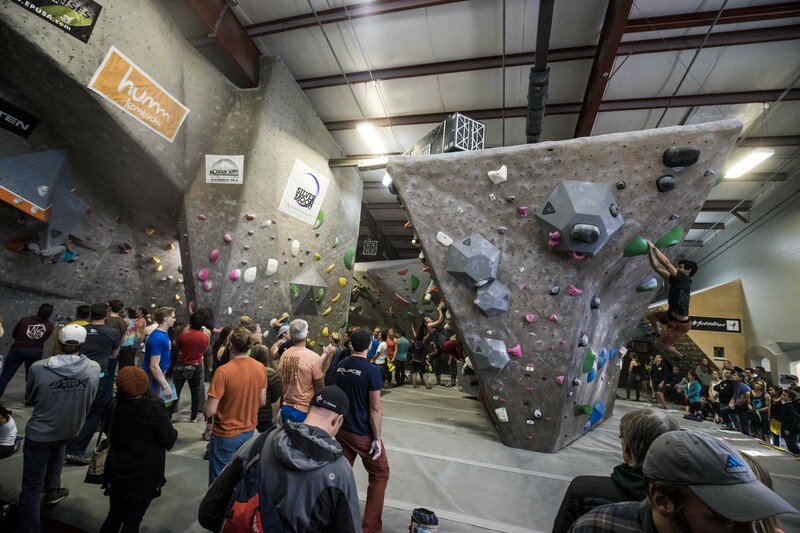 Bend Rock Gym climbing competition goes big, and goes home! "It's a party," says Mike Rougeux, the climbing director at the nonprofit Bend Endurance Academy, who also helps MC the finale. "One of the reasons why this event has been so successful and why athletes come from out of town to compete is because they like the crowd. They like the vibe. They like the audience. It's loud. The audience cheers and screams and claps and yells. When you come and watch, you're part of the experience and the climbers do try harder when everyone's cheering for them. Competitive climbers will say that's what helps them up the wall." The audience involvement through cheering and encouragement creates an energizing atmosphere for the climbers. Based on what Rougeux sees, the sport has a bright future in Bend—especially with such a strong youth movement. BEA even has a program for preschoolers. "The kids like it. It's fun to watch," he says. "But kids that really start training for it are middle school or high school age." Breuner's a strong supporter of BEA's efforts: "They're not just creating climbers, they're creating athletes. The last few Bashes we've had, the finalists' average age has probably been 20 or under. These are young individuals climbing at a really high level." They'll need to be at a high level to counter Jannsen's creative expertise. He's not planning to make it easy. "If everybody does all the boulder problems, or if they all fall in the same spot, we don't find out who's a better climber," he says. "We're making sure different climbers fall at different spots for different reasons. That's my job—not only finding out who gets first through sixth, but also making sure it's entertaining and fun for the spectators to watch. "People like to see drama when they're watching a climbing competition. So, I try to create those moments."